The translation into multiple languages of memoirs, written records of atomic bombing experiences, books, testimonial videos etc. The memorial hall and the museum are connected by a passageway. 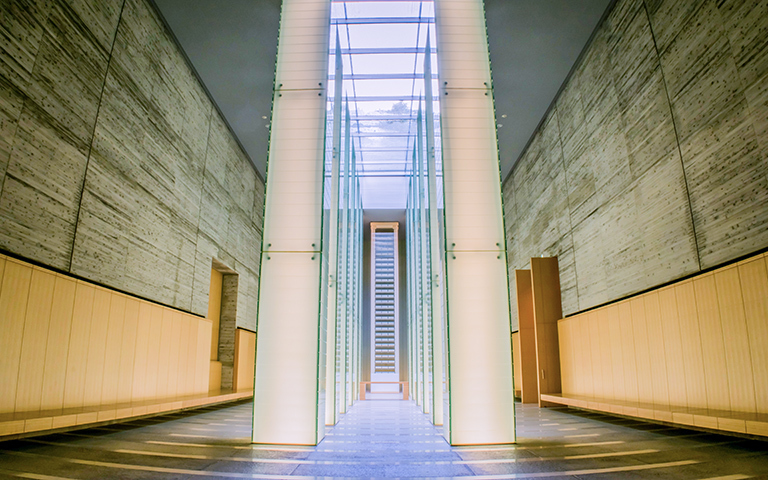 The Nagasaki National Peace Memorial Hall for the Atomic Bomb Victims is a place where visitors may commemorate those who lost their lives as a result of the atomic bombing and offer prayers for everlasting peace. The Memorial Hall hosts services aimed at increasing awareness about peace and activities commemorating the victims of the atomic bombing. We gather materials relating to the atomic bombing out of a desire to pass on the experiences of the victims to future generations, heighten awareness about the importance of peace, and deepen international understanding. We engage in international cooperation and exchange in order to increase awareness about the experiences of the atomic bombings and the preciousness of peace. This site provides materials about the experiences of bomb victims and information about the effects of radiation. Copyright © 2009-2019 Nagasaki National Peace Memorial Hall for the Atomic Bomb Victims. All Rights Reserved.